Back in the days before Ron got unwieldy and Harry got naked in “Equus,” the twosome got in a tangle with an errant blue car over the Glenfinnan Viaduct by Loch Shiel (located in the center of the shot above). The bridge has come to be synonymous with the Hogwarts Express, while the wider location is more commonly associated with Bonnie Prince Charlie’s raising of the standard in 1745. Harry’s adventures had a happier ending. Remember the dragon and the cheering children and the aerial acrobatics? Well, if you look beyond all that, you’ll see Glen Nevis (the lower reaches of which also featured prominently in “Rob Roy” and “Braveheart”.) The Steall falls may be superimposed in the scene, but they’re worth checking out in reality. While you’re there, make sure you attempt to cross the bridge that a Scotsman could only describe as “shoogly”. Luna Lovegood finally gets what’s coming to her as the Hogwarts Express is intercepted on a vast and barren plain by a nasty fellow in a black cloak. What you don’t see are the stunning mountains and lochans (small lakes) behind the camera. Nearby is Corrour Station, where the “Trainspotting” quartet determined it was “sh*te being Scottish.” I’d put that down to their lifestyle rather than the scenery. Rebus Lupin and Sirius Black learn that it’s a dog-eat-dog (or rather a big-dog-throw-little-dog) world beside the Clachaig Gully at the foot of Glencoe. 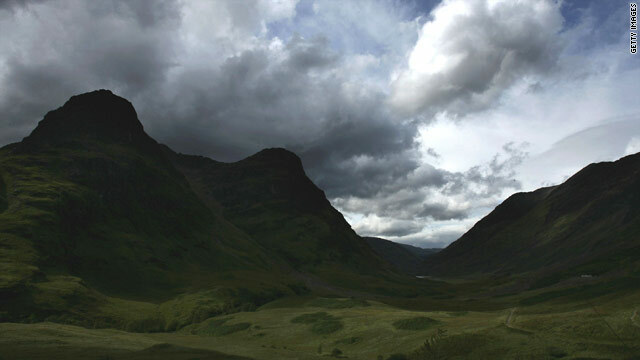 This location was used repeatedly throughout the third Harry Potter adventure, establishing itself as the home of Hagrid, and often the setting of wistful stares towards distant Glen Etive. If you must watch this scene, beware: There’s some typically unforgivable Rupert Grint gurning at just over a minute in. Hagrid gets contemplative down by the loch side, but thankfully has some magical stones and magical surroundings to help shake him out of it. Like Glenfinnan and Rannoch Moor, Loch Eilt sits on the West Highland rail line, meaning you don’t even have to leave your cushioned seat to admire the scenery. It’s best that you do, however. Just remember to bring the bug spray. So, farewell, Mr Potter. Scotland (and particularly its tourism industry) will miss you. But with Disney Pixar’s “Brave” set to put Britain’s northernmost nation in the spotlight next year, along with Chris Nolan’s Batman threequel “The Dark Knight Rises” (currently shooting south of Inverness), our Hollywood dream is very much still alive. Ummm CNN, shouldn't this have been under travel? The next time I learn a blog, I hope that it doesnt dioiapspnt me as much as this one. I imply, I do know it was my choice to learn, but I actually thought youd have something fascinating to say. All I hear is a bunch of whining about one thing that you might fix in the event you werent too busy searching for attention.